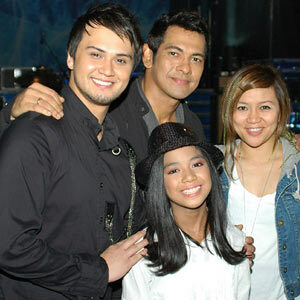 (From left, clockwise) Billy Crawford, Gary Valenciano, choreographer Georcelle Dapat and YouTube singing sensation Maria Aragon take part in the TV special With Love, Gary Valenciano. "The country’s one and only Mr. Pure Energy, Gary Valenciano, celebrates his 28th year in the business via a TV special that will chronicle his colorful and prolific career dubbed With Love, Gary Valenciano this Sunday (Sept 18), 7 PM, on Studio 23. "Gary V, who is indeed one of the most awarded and commercially successful singer/songwriters in the entertainment industry, has produced countless hits that have brought joy and inspiration to many Filipinos throughout the years. "Paying tribute to Gary V in the TV special are some of his colleagues and friends in the industry as well as personal friends including Ryan Cayabyab, Kuh Ledesma, Martin Nievera, Zsa Zsa Padilla, German Moreno, Lorna Tolentino, Ogie Alcasid, Iya Vilania, Donita Rose, Jed Madela, Carla Martinez, Piolo Pascual, Roselle Monteverde, Annabelle Regalado-Borja, Erik Santos, Sam Concepcion, Freddie Santos, and Jericho Rosales among many others. "The special also features some of the Kapamilya Network’s brightest stars such as Billy Crawford, Sam Milby, Yeng Constantino, Jovit Baldovino, Robin Nievera, as well as new discoveries Angeline Quinto, Marcelino Pomoy, and Maria Aragon. "With Love, Gary Valenciano is directed by Johnny Manahan with musical direction by Marvin Querido and choreography by Georcelle Dapat of the G-Force. "Don’t miss With Love, Gary Valenciano this Sunday (Sept 18), 7 PM, on Studio 23."